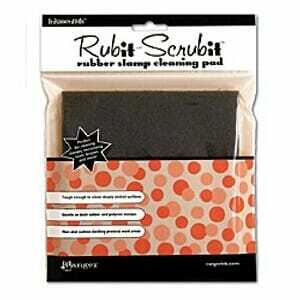 Rubit 6x6 Foam Backed Scrubby. Is the quickest easiest and safest way to clean your rubber stamps no matter how deeply etched. Made of synthetics. Rinse with soap and water. 6W x 6L x 3/4 thick. Customer evaluation for "Ranger Ink - stamp and scrub - 6 x 6 Inch Foam Backed Scrubby"